Professor Rosemary Hollis, of the Department of International Politics at City, has contributed to a new report on the UK’s defence policies. The academic’s analysis of current threats to the country was examined by the House of Commons Defence Committee, which released the report ahead of the publication of the Government’s national security strategy. 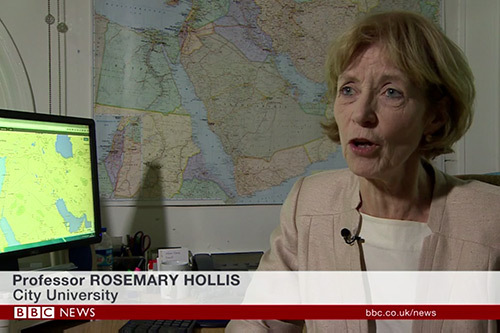 Professor Hollis was interviewed by BBC News on the issue and the challenges facing the UK as it considers how to tackle the militant group ISIS. She also gave a comprehensive overview of the rival forces spread across Syria on BBC Radio 5 Live. In addition, the academic wrote an article for the Observer on the resolution agreed by the United Nations Security Council, which asks member states to “take all necessary measures, in compliance with international law” against ISIS. Herein lies the conundrum for European governments, the British included. Prior to the Arab uprisings, which began in December 2010, both their counterterrorism strategies and migration controls were operated with the cooperation of dictatorial regimes, the very regimes challenged by their populations in the uprisings. Such cooperation continues or has been resumed with the governments of Egypt, Morocco, Algeria, Tunisia, and Jordan, as well as with the Arab Gulf states. The problem derives from the failed states, notably Libya and Syria. The message implicit here is that dictators, or rather those prepared to do deals with Britain and other European states on controlling migration and countering terrorism, are preferable to failed states and chaos. In her full written evidence to the Defence Committee, Professor Hollis looks at threats to the UK posed by “major instability, insurgency or civil war overseas”, particularly in the Middle East and North Africa, and the repercussions of these in Europe. Drawing on 35 years of research, including with the think tank Chatham House, the academic identifies “failed states” as the core problem, explaining the collapse of governments can lead to war and forced migration. Following the publication of the report, the Government set out its approach to defence, in the National Security Strategy and Strategic Defence and Security Review 2015. Writing in the Observer, Professor Hollis says that the UN Security Council resolution does not offer a “viable plan” for the long-term future of Syria and Iraq, and warns the UK must learn from previous military interventions. In her article, After the UN security council vote, the west must heed the lessons of Iraq, she adds that, without troops on the ground to take over control of key ISIS strongholds, “more bombing will not by itself solve the problem”. Professor Hollis’ full written evidence, submitted to the House of Commons Defence Committee, can be read here.